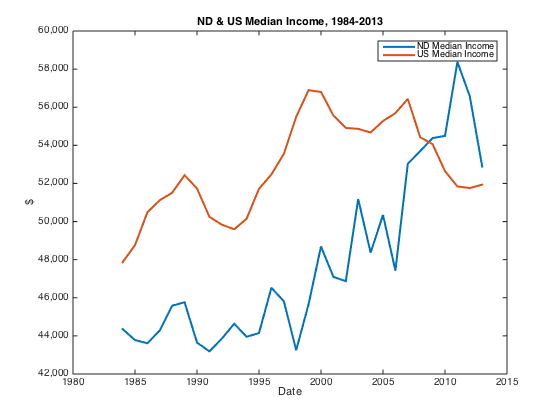 In the year 2000 North Dakota median income was approximately 80% of the United States level. It peaked in 2011 at better than 110% of the US level. That is an enormous change in a short amount of time as far as these measures go. The rate has come back a bit of late, due in part to a temporary pause in growth out west and a fall off from peak years in farming. It will be interesting to see how whether the ratio turns again or if it dips back below the US level for any length of time. North Dakota’s growth is still tremendous, but as growth processes mature they do not necessarily keep up the pace of early boom years. 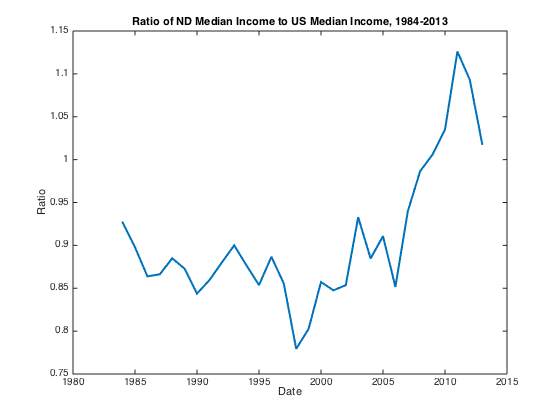 I would suggest that your dimensionality reduction of “How is North Dakota doing?” to a longitudinal study of median income is an oversimplification. While I wouldn’t argue that such phrasing of a survey is optimal, equating “state performance” with a rise in median income trivializes the key drivers of contentment in our nation’s 39th state. It’s even conceivable that higher median income is negatively correlated with a state’s well-being as it taxes infrastructure, results in a rise in prices that disproportionately affect fixed-income and our elderly citizens, and potentially destroys the very environment cited as a key source of North Dakota’s appeal. I’m not arguing that the state forgo all economic expansion in the name of resource preservation and reliance on “community.” But I do believe that monitoring median income over time, and celebrating its rise, may lead us to conclusions that are incongruent with the state’s true disposition. Sure, that is a possibility, but the current context is that these other issues are not a problem and work in the state’s favor AND income is doing well. Plus, big picture numbers get the attention first and then other factors come under consideration for many people. In addition, some of these sources have also revealed negative consequences for the Three Affiliate Tribes. And while I’d hope that a (potentially misleading) headline such as “Median Income Up, North Dakota Doing Great!” would invite additional scrutiny and consideration by the populace, I’m fearful that the consequences of that statistic are not explored thoroughly. I’ve hung on to an economic principle from my UND days… “There’s no such thing as free lunch.” Its my perspective that this increase in median income has come at a cost, and focusing on just the benefit and not the cost could result in poor, potentially irreversible, decisions. Michael, part ofthe research at UND currently focuses on these issues but to say that commenting on income going up above the national level as an equivalent to cheerleadig the economic boom without talking about potential downsides is a bit of a stretch. There are lots of discussions about that, some on my website talking about labor force issues for example. A major issue for the discussions about what may be lost with incomes going higher is a lack of clarity about the issues and incomplete data. You are surely correct that focusing on benefits to the exclusion of costs is inappropriate and I have those discussions on the radio often. However, many seem willing to accept the costs right now in favor of the benefits. Is this an inappropriate discounting if costs and bemefits? Maybe. But there really is no definitive answer right now.